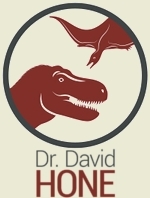 Unsurprisingly, the poor life reconstructions and restorations of dinosaurs get a lot of attention – I certainly intend to get my mileage out of them in the future. But pterosaurs suffer just as much, if not far more. Let’s face it, despite all those minor niggling details that we like to get upset about (the wrong orientation of tails spines in Stegosaurs, spinosaur claw shapes and rearing brachiosaurs) these are actually in the main, pretty minor points. We no longer have to deal with 1930’s style ‘kangaroo’ T. rexes, tail dragging sauropods and ‘two brained’ Stegosaurus – well, less than we used to anyway. Both the public and the scientists, artists, journalists and associated workers have adapted to the modern way of seeing dinosaurs and discrepancies are pretty minor. 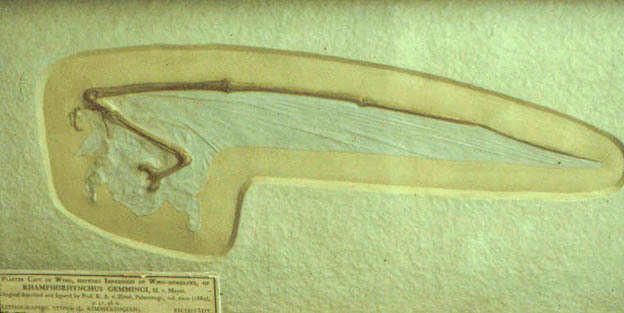 But take a look at a pterosaur restored to live and in some ways we might as well be back in the 1850s! Some of them are incredible. Woefully bad. But really it’s just a function of popularity. Dinosaurs are inherently interesting and have a ‘Wow!’ factor that means new discoveries get public attention – find any crappy bit of dinosaur bone and you are guaranteed a spot in the press provided you can spin it well enough. Discover something truly incredible, new, exciting that updates, confirms, or rejects some major part of pterosaur palaeontology and you will be lucky to get ‘New flying dinosaur find’ as your headline. Great. So while the public perception of dinosaurs has changed with time and new discoveries, that of pterosaurs has not. In fact it hasn’t changed to the point that I know of other palaeontologists (who frankly should know better) who still think pterosaurs are pretty much dull brown, leathery gliders and limited to Pteranodon and perhaps Rhamphorhynchus in terms of diversity. Do they really think that we have learned nothing in the last 50 odd years? 1. Every pterosaur depicted seems to be Pteranodon & Rhamphorhynchus. Generally shown to be the same size and living at the same time and place. There are over 100 pterosaur genera out there – admittedly that diversity is tiny compared to dinosaurs, but there are some real crackers – Tupuxuara, Anurognathus, Tapejara – where are they! 2. All pterosaurs seem to have some form of slack, leathery wings. The wings are not leathery. They are really complex organs with multiple tissue types doing some really interesting things. If they were thick and leathery they would not work. Furthermore, in order to function as an aerodynamic surface they would have to have been elastic. With the wing extended they would be taught and not flap around like a loose sail. 3. Pterosaurs were furry. Not true fur of course, but closer in structure to the proto feathers seen in some maniraptoran dinosaurs. Pterosaurs are almost never shown with any kind of covering (except scales) yet in all probability, they were all furry. 4. The wing shape is all over the place. Pterosaurs did not have pointed wingtips, they were rounded out and the wing would have curved smoothly from the wingtip down to the lower leg or ankle, not in some disjointed angular fashion. 5. Not all pterosaurs ate fish. This might be hard to believe given the amount of depictions we have of them doing so and indeed a great many of the species we have probably did. But there is good evidence for some eating insects, shell-fish, fruit, and small tetrapods (no big surprise really). Even if you are just going to show the marine species, at least have *some* eating squid or small marine reptiles. 6. Pterosaurs are not just dinosaurs that could fly. Well, you can guess my opinion on this one. It seems insane that it still comes up, but in the very cheap dinosaur books for kids you often see it and similar huge errors (like mammoths and ictyosaurs lumped with the same title). 7. Pterosaurs did not just live on cliffs or hang upside down from branches. For a start they could not hang upside down (or at least would not habitually do so – the foot shape is all wrong) and why would any animal (including modern birds) spend its entire terrestrial life on a cliff-face. At least gulls and terns can land bipedally on a ledge – pterosaurs are always shown landing quadrupedally on a sheer surface! 8. Following on from 7, pterosaurs were not all terrible on the ground. Some doubtless were highly mobile and active, and even the worst of them could probably struggle to a tree quite quickly. Look at bats – many of them have more intimately linked fore and hindlimbs than the pterosaurs yet we have terrestrial hunters like Mysticinus and the vampire is capable of a full gallop – why must pterosaurs always be shown flapping around on the ground?. 9. Pterosaur teeth seem to fox just about everyone. Some (like Rhamphorhynchus) had long almost fang-like teeth while many others had none (there are, of course all kinds of intermediates but these are by far the most common situations) yet each seems to appear constantly in the wrong jaw. Toothless Pteranodons are shown with a maw of spiky death and able biters like Sordes are left with the ability to viciously gum passing insects. To cap it off, none ever seem to have beaks. Yes, pterosaurs had beaks not unlike those of birds, even the ones with teeth, yet again we are left with scaly ‘reptiles’ with no lips and just teeth poking out of the mouth. 10. I don’t want to repeat the point with pterosaurs that I made so recently with dinosaurs, but far too often they are depicted in shades of green and brown. Far more so than their cousins, pterosaurs would have been bright and boldly coloured – few would have had any predators to fear or prey to ambush while hunting insects or fish and could indulge. We can see that from the huge array of crests that they sport, even in the most basal of taxa, so lets get some colour in there (and while we are at it, Pteranodon longiceps is the only species with that crest, take it off all the others). Well, that was rather more detailed than I had envisaged and there was plenty of room for more. Sadly, I doubt many of those for whom this essay might be useful will never see it. I am not pretending that everything needs to be exactly as I propose here (doubtless some were bald, ate fish, had no beak or teeth and could barely move on the ground) but we know so much about pterosaurs and I never get to see any of it on the page, while feathered, bright active theropods now stalk every book that comes out. A few concessions to the last 50 years of research would be nice. This is a revised Mk.1 post, to see the original with comments etc., go here. Well, if it’s any consolation, at least one person who may find this useful has read it. Granted, I may be somewhat unique, as both a paleontology fan and as someone who hopes to one day make movies. It strikes an additional chord because one of my favorite stories growing up was At the Earth’s Core, where the main villains were sentient pterosaurs (rhamphorhynchoids of a sort). A bit of a question, though: what do you mean about pterosaur wingtips? Every pterosaur picture I can find (in the books I have or by Google Images) features wings that come to a point. Does the art just lag way behind the science? Also, one note on the lack of furry pterosaurs in movies and TV: pycnofibers are realistic, but in the case of CGI, they, like hair, can be very difficult to render properly, and I’d imagine many film makers go with “naked” pterosaurs rather than furry ones for this reason (the same thing applies to the feathers on dromaeosaurids). Obviously this doesn’t apply to drawings or paintings. Anyway, I love the information, and am looking forward to reading your post about pterosaur wing structure! Yeah the wingtips are just really behind. Even in a few papers I’ve had to remind my colleagues to use rounded and not pointed wingtips. Though oddly enough perhaps the best specimen to demonstrate this is the ‘Zittel wing’ which has been knocking around for over a century, so in a sense the science was a long way behind the science for too long. Actually, having taken a look at the Zittel wing, the art may not be quite as wrong as I thought. The Zittel wing does indeed have a rounded tip, but the patagium still appears to narrow considerably toward the end of the wing finger. So while the pterosaur may not have been flapping around a Stabby Pointy Thing of Doom (http://www.internal.schools.net.au/edu/lesson_ideas/dinosaurs/images/rhamphorhynchus.gif), the membrane is not so rounded as to resemble the outline of a bird’s wing. In this case, some depictions (http://filozofia.wplanet.hu/images/Rh3.jpg) are not too inaccurate. Well i never siad it was magpie shaped say, but the tip *is* rounded and you’ll struggle to fin even papers that illustratue this correctly. I meant no offense, and I’m sorry if I sounded like I was disputing you. What I was trying to say was that I personally misinterpreted what you meant by “rounded”. Of course, the Stabby Pointy Thing of Doom (or one could call it “scythe wings”) art is still wrong, and as you said, it is still around and unfortunately common. Again, sorry if I bothered you there. No worries, just clarifying. It’s a detail yes, but one that should have been obvious to researchers for a hundred years yet only recently seems to be consistently referred to. While small, it’s potentially an important point as this does affect tip stall and their ability to turn -it’s a major issue for a flying animal. Are there ANY accurate artistic reconstructions? Is there a list somewhere of different Pterosaurs and their traits? Well the obvious thing to do is direct you to Pterosaur.net (see the links above) where there’s kinds of pterosaur stuff by me and some colleagues. The main site includes some artwork and various fossils and talks about things like kinds of pterosaurs. I think you mean taut not taught. Blame AutoCorrect – happens to me all the time. Every pterosaur skeleton I’ve ever seen has had bat-style feet, with the toes arranged perfectly to hang from cliff faces or branches.. Not one has looked like it would remotely walk well on land.. so there’s that. also how is a wingtip going to be rounded? come on.